St George’s Church Hall is situated in George Street, directly opposite the Church. It is a valuable resource for the church and the wider community. 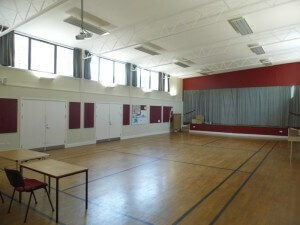 The hall is available for let to commercial organisations and to charities. It was extensively refurbished in 2009 when disabled access and improved lighting for people who are visually impaired was added. The main hall has a stage which can be partitioned off and used as a separate meeting room. 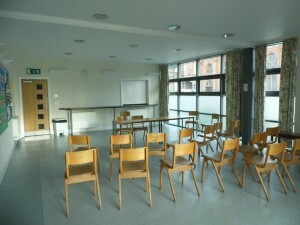 There is a second meeting room, which is adjacent to the kitchen and is used for meetings and events. 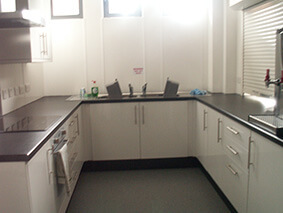 The kitchen is used to provide hospitality at various functions throughout the year. The hall is very well used by church groups and also by other community organisations. We work hard to provide, support and encourage participation in a range of pursuits in St George’s Church Hall, whether organised by the church or through external lets to community groups. When we receive your request we will contact you to discuss your requirements and confirm availability. 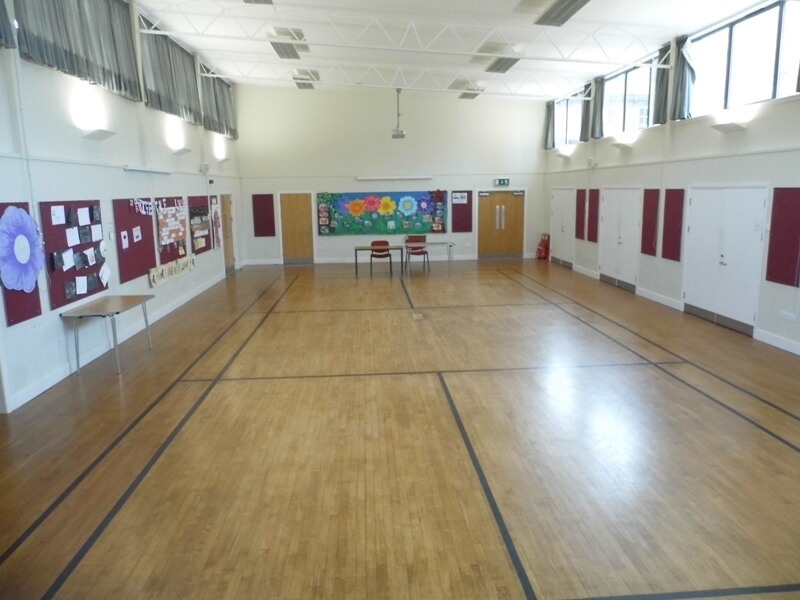 Wishing to be fully involved with our local community, we are keen to see our hall used to its full capacity. The hall and rooms are therefore available to be booked on a regular basis or for occasional bookings. 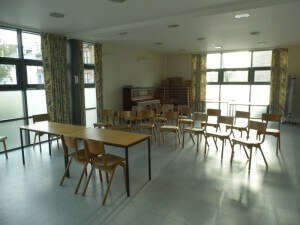 There are four bookable rooms within the hall. The Main Hall is suitable for a wide variety of activities and can be set up in different ways; as a theatre to view the stage, with a smaller seated audience to view screen at rear of the hall, with tables and chairs or as a open space. Its dimensions are 17m by 9m and it can seat about 200 in theatre mode. The main stage does not have a permanent sound system but sound equipment could be provided by prior arrangement. Projection facilities could also be provided by use of a back projector on the stage, again by prior arrangement. 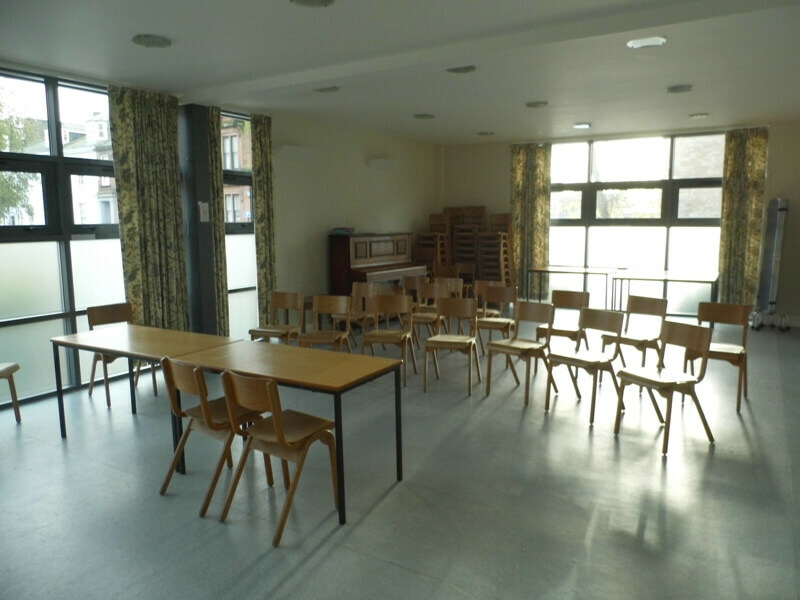 The hall is also equipped with a low resolution projector and a sound amplifier and speakers at the opposite end of the hall from the stage which can be used for presentations or talks, suitable for an audience of about 100. A wifi connection is available for hall users. The Main Hall is let by the hour at a cost of £30 for commercial organisations and £22 for charities. The length of the let should include any set up time and any clearing up time. To book a let or to make further enquiries please follow this link to make a booking request . The Stage Room as the name suggests forms the stage for the main hall. It is partitioned by sliding doors and in its own right is a space for small groups meetings. It would be suitable for groups of about 40 to meet in. Its dimensions are 9m by 5m. This room does not have any permanent audio visual facilities but has access to the hall’s wifi. This room is accessed by several steps and is not suitable for wheelchair access. 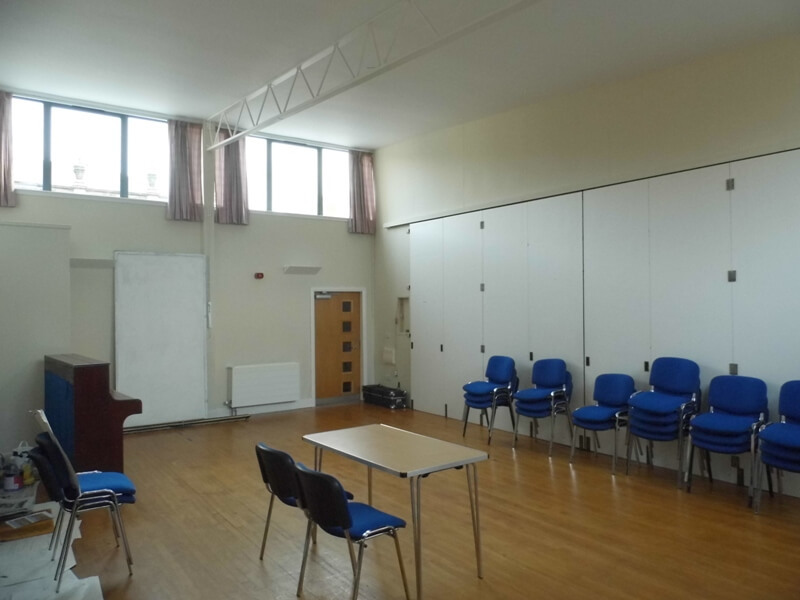 The Stage Room is let by the hour at a cost of £14 for commercial organisations and £10 for charities The length of the let should include any set up time and any clearing up time. The Club Room is adjacent to the kitchen and has a serving hatch. It can be used to serve refreshments but also is a good light and airy space, suitable for small meetings or presentations. It can comfortably seat around 60 people. Its dimensions are 10m by 6m. It does not have any permanent audio visual equipment. It can access the hall’s wifi. 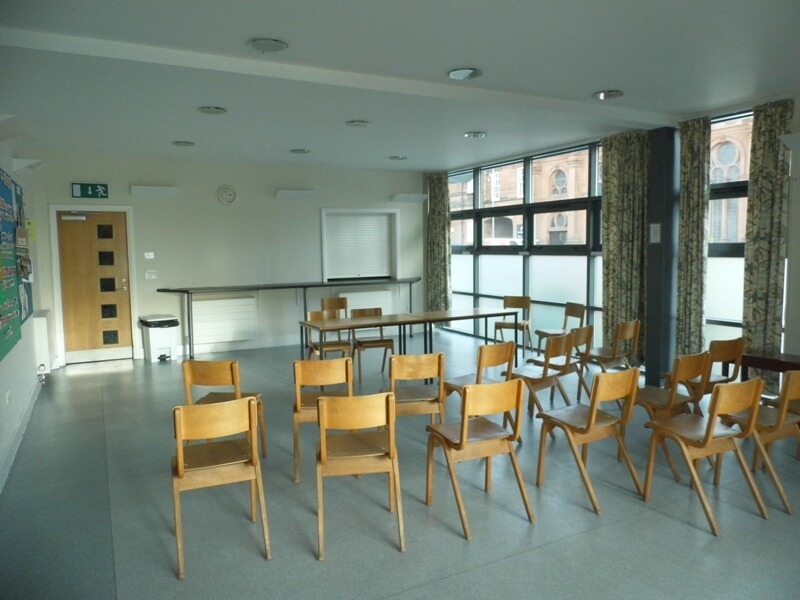 The Club Room is let by the hour at a cost of £17 for commercial organisations and £12 for charities The length of the let should include any set up time and any clearing up time. The kitchen is suitable for the preparation and distribution of drinks and snacks and comes equipped with a hot water boiler, oven and hob, reasonable worktop space and a double sink. The Kitchen can only be let in conjunction with another room at a flat rate of £25 for commercial organisations and £15 for charities. To book a let or to make further enquiries please follow this link to make a booking request. 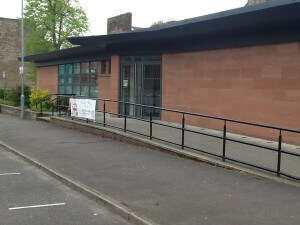 Car parking spaces are also available for rent from St George’s Church. For details of costs, rental arrangements and availability please call the Church Office on 01387 267072. 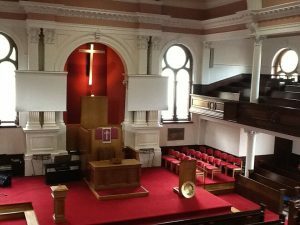 Church Bookings: Due to renovation work taking place in the church from January 2019, it will not be possible to confirm church bookings until later in the year. To enquire about church bookings please email: bookings@saint-georges.org.uk, telephone 01387 950911 or alternatively the Church Office on 01387 702067 . Details of costs and how to book the church after the work has been completed will be provided later in the year. 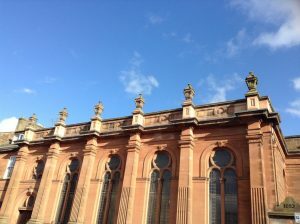 Church Bookings: Due to renovation work taking place in the church from January 2019, it will not be possible to confirm church bookings until later in the year. To enquire about church bookings please email: bookings@saint-georges.org.uk, telephone 01387 950911 or alternatively the Church Office on 01387 702067 Details of costs and how to book the church after the work has been completed will be provided later in the year.